I’ve been branching out with my hobbies particularly in the last year or so, mostly because my back problems now prevent me from spending every waking hour hunched over a PC, coding. In a way that’s a shame - I lament the sudden drop-off in coding time and hence productivity - but it’s also good to broaden my horizons a bit. I’m 36 now after all, and spent the vast majority of my spare time in the last 8 years on Ogre, so maybe I deserve a break 😉 After all, I get to work on Ogre a bit as part of my day job now anyway, if not as much as I’d like. 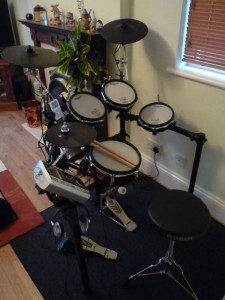 So, I recently bought a set of electronic drums, specifically the Roland TD-9KX. It took a while for everything to turn up, and quite a lot of time to tweak the setup until I was comfortable with it (and even now I’m still making small adjustments), but it’s been great so far. It’s amazingly expressive for an electric kit. Now of course, I didn’t buy this kit as a Rock Band peripheral - that would be crazy, I’m learning to play drums properly in the first instance. But still, when you have this expensive kit in the room it feels silly to use the old plastic Rock Band drum kit when we play, so I sought to hook it up. I also wanted to map the inputs as realistically as possible, so for example I wanted to map the closed and open hi-hat separately (to yellow and blue respectively) so I could use the pedal for songs that had that charted (which is most of them). The first thing I did was buy a MIDI interface - because the 360’s controller inputs are encrypted, you can’t just use a standard MIDI to USB converter so I bought a dedicated box to do it. If you already have the GHWT drums you can just use the MIDI input on that too, but since I didn’t I decided to get this because it was compact. The next thing was to configure the MIDI outputs on the TD-9 to properly map to the inputs in the game. Although there is information in many places on the Internet on how to do this, I didn’t find a single place that listed everything together, and I had some issues with the partial information that was out there, so I’m going to set out everything together here. The asterisks which appear in the display, which I’ve included, just mean the MIDI code is assigned to more than one pad, which is fine. Also important is that on dual-triggering pads there are actually 2 of these tables (see whether it says ‘HEAD’ or ‘RIM’ in the corner). To switch, just hit a pad in the appropriate place. Personally I set the rims of the main pads, and the edges of the cymbals to be the same as the main head/bow but that’s up to you. Triple-triggering ride cymbals show up as head/rim on this page, and the bell is the ‘B’ entry, of which there is only one. If you do set up your cymbal edges this way, be careful of dual triggering. I found the standard sensitivity settings to be fine but some people have dialed their pad sensitivity down to prevent it. Personally I didn’t want to change the feel of the kit for real playing so didn’t do this. I had originally increased my cymbal sensitivity a notch or two because I felt they weren’t loud enough, but now I’ve been using them a few days I’ve found I don’t need to do that anymore (I’m less shy about whacking them!). I was getting double-triggering when the sensitivity was up, but not now it’s back to standard. Some people have also adjusted their other triggering settings to avoid dual-triggering on the main pads and kick pedal for example, because the kit is so sensitive it sends a hit even if you only lightly hit it, or the kick pedal beater ‘bounces’. So far I haven’t changed this because again I want normal operation when playing for real, and I’ve adjusted my kick pedal beater angle to reduce the cases of unintentional ‘bounce’ (which is good to remove anyway) and try to be more accurate on the pads. I figure it’s better that way than to tune your kit specifically for Rock Band triggering. That sets up the separate open/closed hi-hat settings which I wanted to use for yellow/blue respectively. Again note that the hi-hat is dual-triggering (bow and edge) but I’ve set them to the same thing. So there you go; a complete guide to using the TD-9 as a Rock Band controller - this took me some experimentation and collation of several very large forum posts to get completely right, so maybe someone else will find this useful. Now I just have to train my brain to hit the note charts properly while still using the correct cymbals and hi-hat pedal as well, and not just falling back on the 4 basic pads as per the Rock Band controller. The hardest for me is the open hi-hat (learning to use my left foot too) and the ride / crash combinations since they’re backwards spatially (on a real standard kit the first crash cymbal is to the left of the ride cymbal). You really need to know the song so you know which specific part to play, but that’s the point - I’m hoping it’ll help me learn a few tracks to play stand-alone too.